One of my all time favorite snacks are arancini. 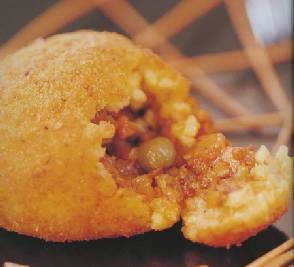 A Sicilian speciality of fried rice balls with various fillings. I've put them on the menu as an appetizer at a few of my restaurants and was excited to try "the real deal" when I was in Palermo. 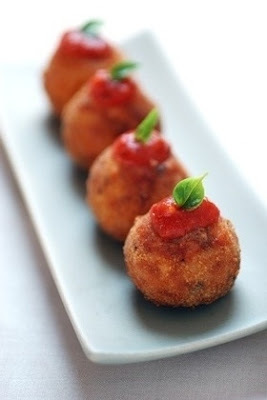 Arancini can also be filled with cheese, prosciutto, or seafood. In restaurants I serve mine stuffed with mozzarella di bufala and served with a sundried tomato arrabiata sauce. In Rome these are known as supplì al telefono, because when you break them apart the strings of cheese in the center resemble telephone wires. divide the risotto into approximately 3 tbsp portions. form the portions into ball shapes. 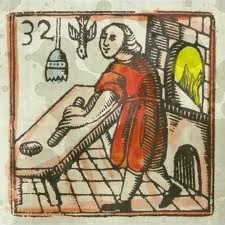 I'm making this for tiffin tonight. I think I'll try to shoot it, but I don't think it will be as pretty as your picture!